Glowing skin is in. We at HiBrow are dedicated to enhancing your natural beauty. Dermaplane is a safe, non-invasive treatment which uses a special tool stroked along the skin at a forty-five degree angle. While holding the skin taut, the esthetician uses it to remove “peach fuzz” as well as dead skin cells. Dermaplane is performed as a stand alone treatment or prior to other skincare treatments to enhance their results. 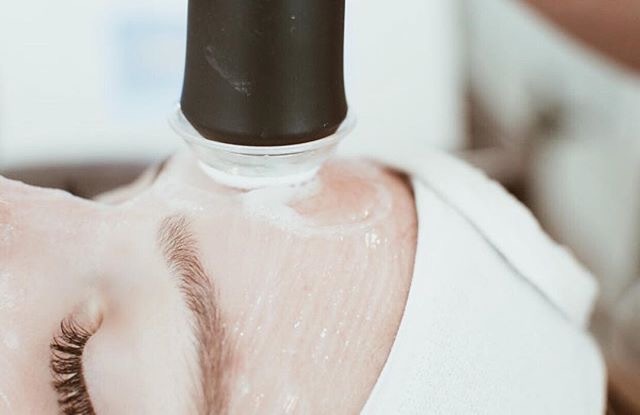 This is a wonderful form of manual exfoliation that can be used with or without chemicals to effectively smooth acne scars and give you the smoothest possible skin.. Best of all, dermaplane does not require any downtime–just immediate results. Clients may feel "wind burned" the day after and will experience some redness due to increased circulation. There may light shedding of the skin which can be treated with a gentle moisturizer. Exfoliating treatments should be avoided for the next 72 hours after treatment. • Dermaplaning is recommended every 4-6 weeks for maximum results. OxyGeneo provides 3 effective facial treatments simultaneously. It combines gentle exfoliation, natural skin oxygenation, and a deep facial rejuvenation with the infusion of essential revitalizing nutrients.